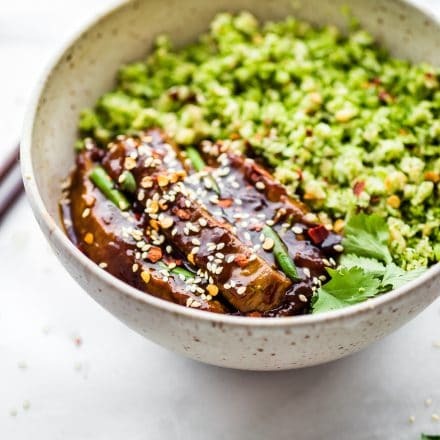 These Paleo Mongolian Beef Broccoli “Rice” bowls are quick to make, light, and full of flavor! Riced broccoli keeps this dinner paleo and gluten free. First prepare all your veggies. Slice your scallions and thai peppers (if you are following spicy version). Mince garlic/ginger. Keep them close by. Slice meat into thin strips. Toss your meat in 1 tsp oil and 1 tsp starch. place in bowl or ziplock bag and marinade in fridge for 10 minutes or up to 1 hour. In a small sauce pan, add your 1 tbsp oil, garlic, and grated ginger. Stir fry until fragrant. If you are following spicy version, add 1 sliced thai red pepper while frying. Whisk together your 1/3 to 1/3 cup gluten free tamari soy sauce (I use san-j brand), broth, and sugar. Add to sauce pan. Bring to a boil then reduce and simmer on low until thickened. Around 10 minutes or so. Heat a large skillet pan with 1/3 c oil. Lightly coat beef strips in extra 1/4 c starch, then place in pan to fry/sear. Fry in oil for about 1 minute each side. Browning the steak strips. Reduce heat then drain oil from pan or use slotted spoon to drain. Add your Mongolian beef sauce and cook with meat 1 min. Coating the beef evenly. Then set aside while you make the broccoli rice. Cut your broccoli head into 3 to 4 parts. Place each into blender or food processor until all is “riced” texture. Place in a large microwave safe bowl. Add 1 tbsp broth or water. Salt/pepper to taste. Add garlic powder and chopped cashew to broccoli rice if desired. Add 1/2 cup or more broccoli rice to bowls. Then place beef and sauce on top. Sliced scallion and red pepper flakes to top! Sesame seeds and optional coriander to garnish each bowl. If you want it extra spicy, add 1 sliced red thai pepper to your sauce or to beef when frying. Works great with coconut palm sugar or raw turbinado sugar. Honey will work in place of coconut sugar, but the beef will be more sticky. Nutrition shown is per bowl, with oil drained.